This week I removed the old, worn, and stained carpet from the passenger area and installed a new vinyl tile floor. 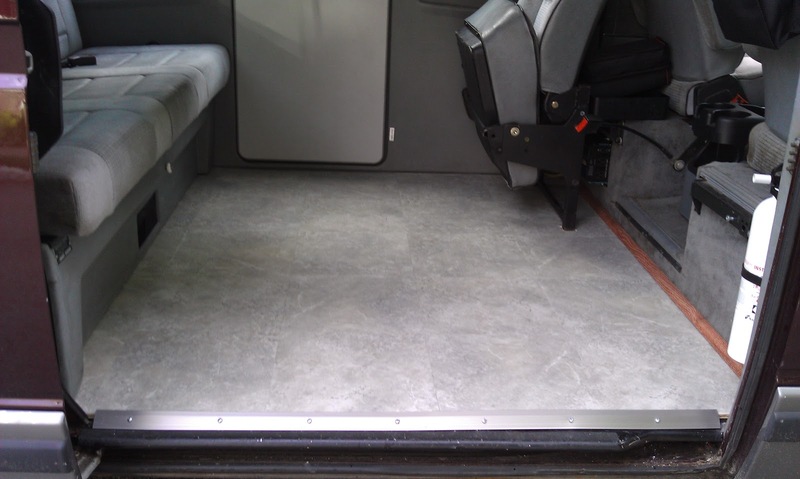 I was originally planning on hardwood, but in the end opted for tiles for a few reasons: they're much easier to install; I think they look better with the original gray interior of the Vanagon; and they have a slightly softer and more textured surface, which is much easier on the dog. After removing the trim from the bench seat area (very simple: two large bolts in the upper corners and four floor screws along the inside base), I easily pulled away the carpet and foam underlayer to reveal the bare floor of the Vanagon. I then cut two sheets of 1/4" plywood: one measuring 52"x30", and the other 52"x31". Notch the corners to fit around the support structure of the bench seat. Make sure to carefully measure the location of the jumpseat mounts and drill the holes using a 1 1/4 " key hole bit. You may notice that I didn't measure carefully enough the first time around and had to drill two more holes. Measure twice, drill once! Before laying the floor, I added some Roberts Unison Foam Underlayment to help soften and stabilize the subfloor and dampen the road noise. 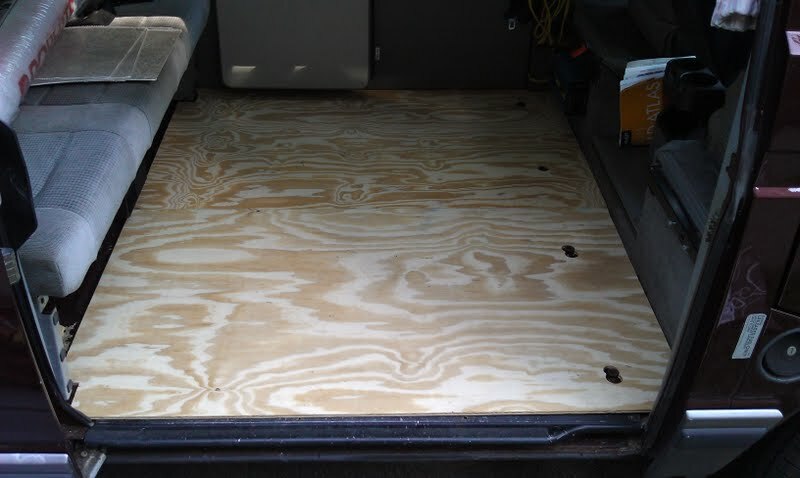 There was no need to glue or otherwise fasten the plywood to the floor of the van. The two pieces fit perfectly together, laid flat, and with the holes and notches, they had no room to shift. The bench seat hardware also secures the new floor to the van. 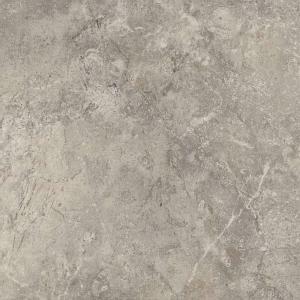 I decided on Armstrong resilient vinyl tiles in Rock Creek Charcoal. The 12"x12" tiles are packed in boxes of 30--about 22 sq feet is needed for job--and I bought them on sale for just $34 at HD. They are flexible peel-and-stick tiles, easy to lay and cut. I used a utility knife to slice out the jumpseat mounts after I laid the tile and to trim and notch other tiles as necessary. I decided not to cut the mounts for the second rear-facing jumpseat because we don't plan to use it any time soon. I finished off the front using a strip of carpet edging. I glued a quarter round strip of (faux) cherry wood to clean up the other edge. The finished product looks great and it's going to be much easier to keep clean while on the road. If you're thinking about upgrading your Vanagon floor, I strongly encourage you to consider these tiles over carpet or hardwood. I love this blog. I'm in the process of restoring my '85 Vanagon GL. Planning on putting in a bamboo floor. This post was very helpful indeed. Any tips/tricks you could share? Go for it, Jake! I also considered Bamboo. I love the look and the idea of using a sustainable surface. I ultimately went with the resilient tiles because time was running out before this trip and I knew that our dog would have a much harder time on the slicker bamboo surface. Bamboo will be more difficult and time consuming to lay, and you'll definitely need more planning time up front to determine the measurements and pattern to minimize waste. It's obviously harder to cut 5/8" bamboo boards than soft vinyl tiles. If you lay them across (parallel to the length of the vehicle), you won't need to lay a subfloor, which will save you some time. But I still recommend putting in a soft underlayment to dampen road noise a bit. Good luck! Search thesamba.com forums for lots of images and support. I'm going to do something very similar. How did you not need to bolt the floor down? Do the jump seats and metal trim lock it in? I don't have jump seats (though I will add some metal trim at the door), and I feel like I will definitely need to bolt it down. Also how has your experience been with your tile floor? I'm debating what to use ... carpet seems "cozier" ... but tile or laminate would be much easier to clean. Thoughts? Tile floor has been excellent! Do you have to bolt it? No. The plywood subfloor is cut to fit the space quite tightly. The trim beneath the bench seat is screwed into the floor from the rear of that plastic panel (you can see the holes when you lift the bench). AND, the tiled floor is secured by the trim on the sliding door side. Also, the combined weight of the tiles, although vinyl, is still quite heavy. Nothing shifts. One suggestion not included in the post: Prep the floor with a Bond Enhancer Self-Stick Tile Primer (like this http://tinyurl.com/9t8jee8). The first time around, a few tiles began to lift. After applying the primer and laying new tiles, not a single bit of lift, even after lots of wet, slushy, muddy adventures. And that's where tiles make so much more sense than carpet. I just sweep out the dirt or wipe them down. You want some added coziness? Get a nice area rug to lay on the tiles! And that Roberts underlayment was between the metal floor and the plywood? I did this recently to my 84 Westy. The underpayment was reused so it was simply cleaned and the new tiles installed. An easy 4 hour job with a very low $25 price and a huge transformation! Do it! Ended up doing this last year, worked out great, thanks for the help!